Continuing my stroll around Poole’s hostelries I made my way to the quay with a whole row of pubs facing onto the harbour front. I walked past them all to get to my furthest planned pub The Cabin. It appeared to do what it said on the can, it was a shack that sold pizzas, burgers and cocktails with a couple of Lagers thrown in for good measure. I didn’t hang around. Opposite was a closed pub , The Swan Inn, it would seem no one would be swanning in anytime soon. Back around the corner to the front and the next pub was well open and well attended. The Lord Nelson. A pretty looking pub, inside retained a pubby feel despite some previous knocking through. A Blues/Rock band were setting up in one corner and had started their set before I came to leave. 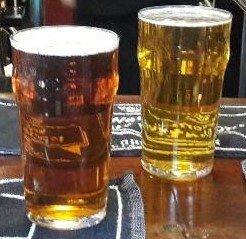 The beers were all predictably Hall & Woodhouse, I had a pint of Old Harry’s Pale Sail which was ok in itself but unfortunately was offered up in a poly-carbonate receptacle, not so good. Equally as busy as its next door neighbour I found a historic pub now ruined by Greene King’s deathly touch with all internal character having been ripped out by some misguided refurb, worse still (possibly a blessing in disguise) I found five handpumps , everyone with its clips reversed, I moved on. I approached the next on the list with some trepidation, it was a Spoons , not my favourite manifestation of a pub, but it couldn’t be worse than The Jolly Sailor , could it? Not quite but almost. Topically named, The Quay isn’t overly attractive to look at though I concede it has its attractions for some. It had beer, one up on the Jolly Sailor, It had different and slightly more interesting beer, I went for a half of Hambledon Nightmare Porter. The beer was served far to cold but drinkable, but the real nightmare was that it was served in a proper plastic glass, back to square one. I pushed on with two pubs left to do on the quay, the first of which was The Poole Arms with its extensivley green tiled exterior. Another pub that had been modernised inside, but in a nicer more tasteful way. A little leaning toward the foody side of things, majoring on Seafood, it still felt like a pub, plus the beer selection was a bit better than most of the recent efforts with five beers available, Flack Manor Double Drop, Dartmoor Jail Ale, Exmoor Hound Dog, Ringwood Forty Niner and St Austell Proper Job (which was proper good). The Penultimate pub of the day was The Portsmouth Hoy. Another very busy pub and another Hall & Woodhouse pub. Traditional inside but pandering to the tourist with nautical themes and beer barrel tables. The beer (Fursty Ferret) was average. It was time to head back toward the train station, so far with the exception of two or three pubs, the general trip had been on the disappointing side. This made me a bit grumpy, as seen in this selfie. I soon cheered up after the Ice Cream. Halfway back to the train station, a little out on a limb is The Brewhouse and kitchen. A large extended pub, open plan inside and a decent courtyard beer garden. They as the name suggests brew their own beers and of a large food menu. The Telemark Extra IPA was the best beer I had all day, but I had a train to catch so didn’t stay for more. In summary Poole has a lot of good looking pubs , but on the most part they flatter to deceive, Poole is not a beer destination town it would seem. Very interesting pair of posts Citra. After part 1 I was hoping for a happy ending but I guess the B&K and the ice cream was it..
Shame really, I agree some lovely looking pubs externally, so very sad they’ve been badly treated. The Ice cream was great, I actually had another after that, but pub – wise your not missing too much. Poole is my hometown and it has never really been a great place to find good beer. You did miss a couple of my favourites though – The Blue Boar (Fullers) and Drift micropub, which is a few door down from the Portsmouth Hoy and well worth a look if you’re down on the Quay (I was in there on Tuesday!). A Poole crawl is best done in two parts – highlights from the town centre and then a short bus or train ride out to Parkstone to check out the excellent Bermuda Triangle plus Bricklayers Arms, Barking Cat, Cow, and Poole Ex Serviceman’s Club. One for another day maybe! Gutted I missed the Drift out, obviously lacking in my homework, but it was a last minute decision to jump on the train and go there, Parkstone looks worthy of a look.